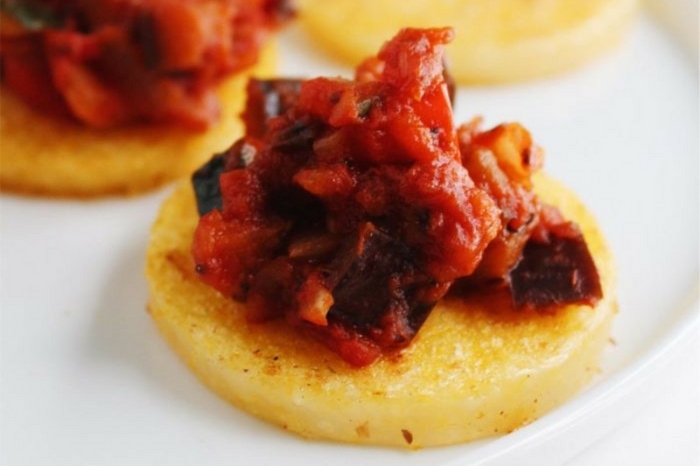 Seared polenta rounds with ratatouille are easy to make and come together quickly. 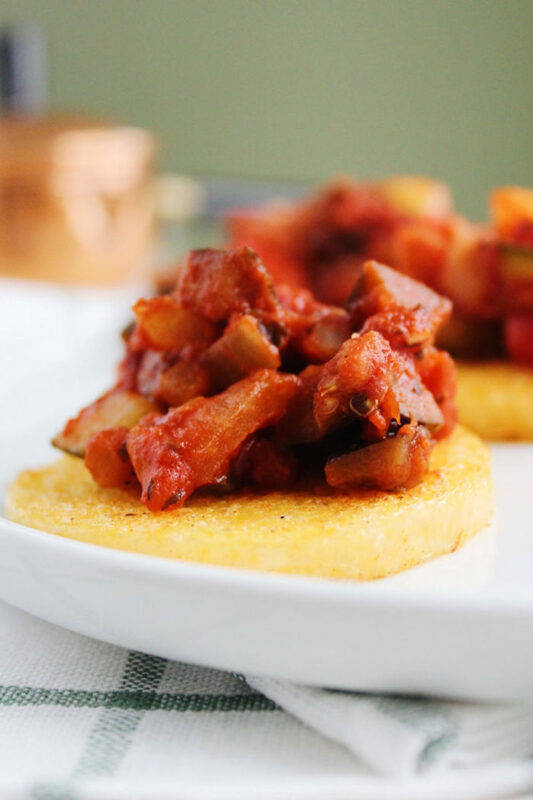 Prepared polenta gets a quick fry in olive oil to form a bed for a flavorful and healthy ratatouille. 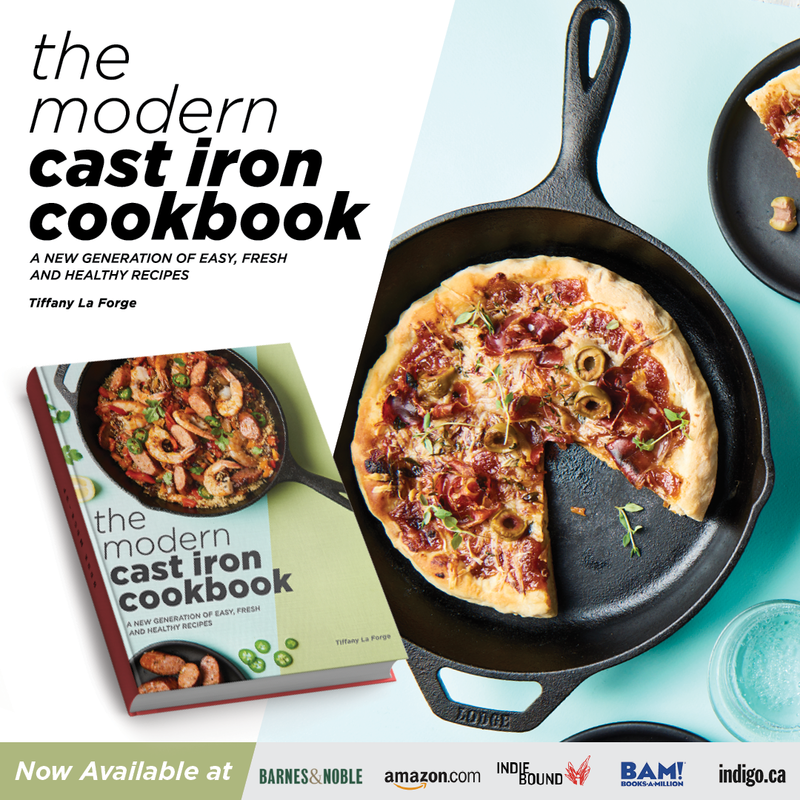 I love hosting, and I’m always trying to create new and interesting recipes. 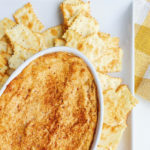 Two-bite finger foods are the best, aren’t they? 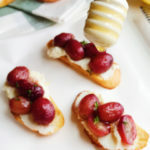 When I think about my favorite finger foods, I immediately gravitate towards antipasto, cheese and crackers, and bruschetta. 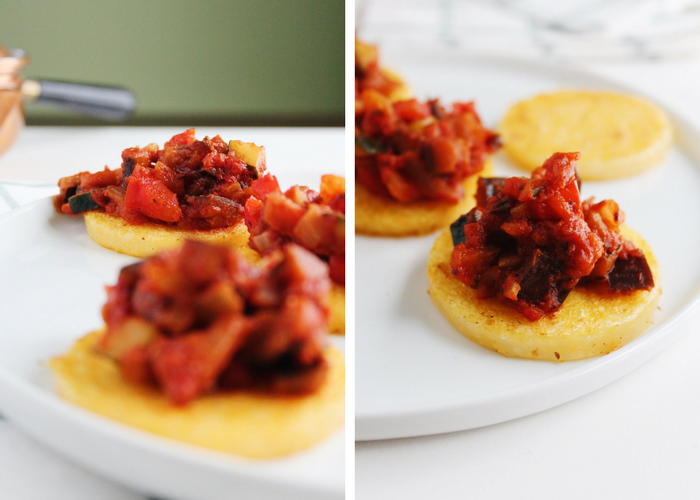 These polenta rounds with ratatouille are a bruschetta of sorts. Instead of a baguette, a seared polenta round forms the bottom, with a slightly crisp exterior and soft, buttery center. 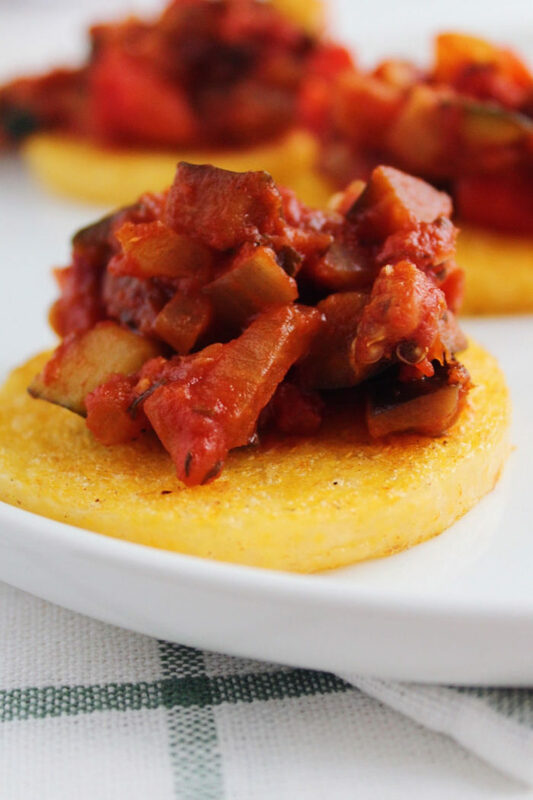 A simple and flavorful ratatouille crowns the polenta rounds. I like to think of these as a winter bruschetta, since they are served warm and replete with comforting, savory Italian flavors. 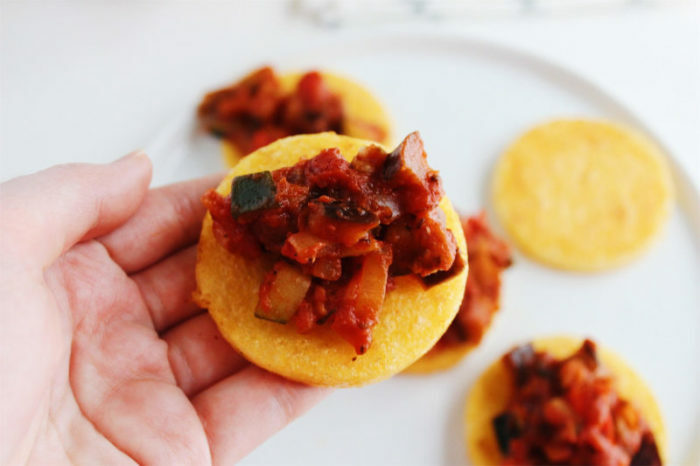 Not to mention: these polenta rounds with ratatouille are so easy. I simply buy prepared organic polenta and slice the cylinder into 1/2″ rounds. The rounds get seared in olive oil until browned and crisp. Meanwhile, ratatouille bubbles away on the stove, full of onion, garlic, eggplant, zucchini, thyme, oregano, red bell pepper, and tomato sauce. 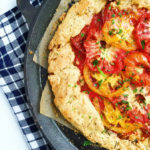 Using a high-quality store-bought tomato sauce ensures this recipe comes together in a pinch. 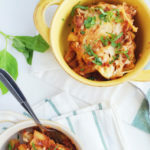 I love using RAGÚ® Homestyle Thick & Hearty Traditional Sauce here. It’s super thick, full of flavor, and it works wonderfully in this ratatouille. 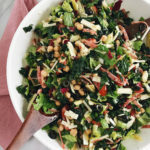 It imparts a great ‘made-from-scratch’ taste and is full of fragrant herbs. 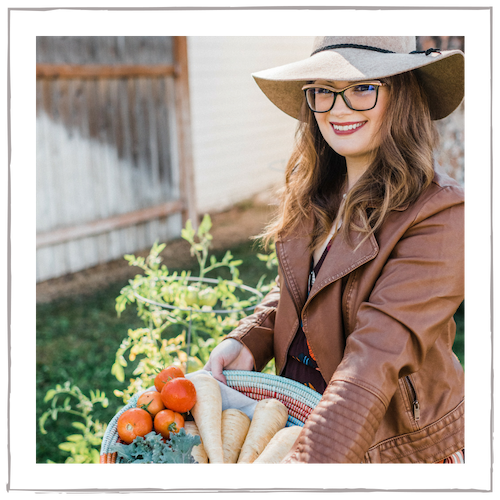 Plus, there’s no artificial colors, artificial flavors, or high-fructose corn syrup—a must for me when it comes to choosing ingredients. Ragu is celebrating their 80th birthday! It’s been a part of our family forever. It was the only jarred sauce my grandmother would use, and now my mother doesn’t dare use anything else either. I love to update family inspired recipes and traditions into new spins, like this polenta recipe which is now one of my family’s favorites. 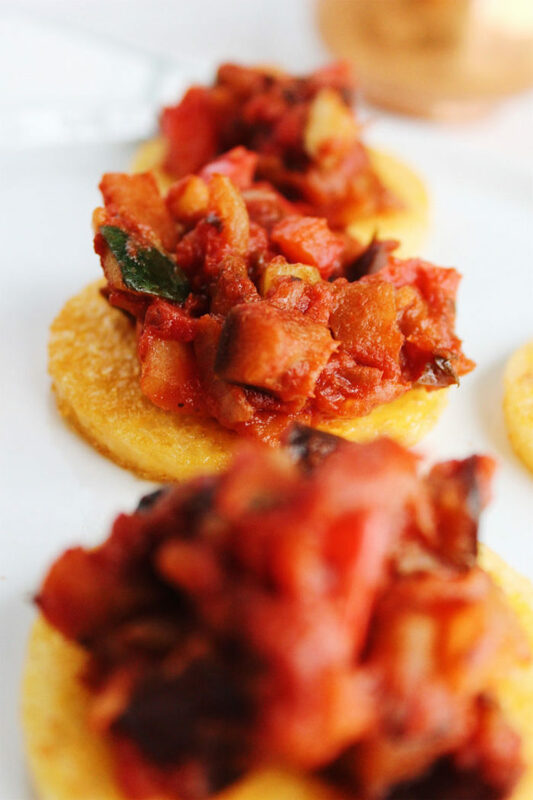 Scroll down for a video on how to make these Polenta Rounds with Ratatouille! 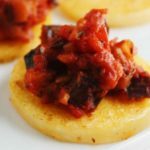 Thank you to RAGÚ® for sponsoring this Seared Polenta Rounds with Ratatouille post, and Happy 80th Birthday! 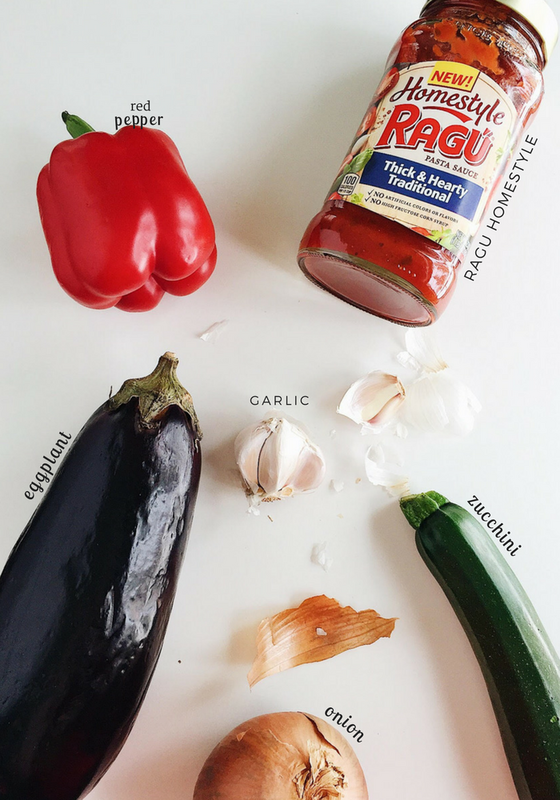 Watch our video below, and head over to Ragu’s recipe page for even more delicious and easy meals. Make the ratatouille. Heat 2 tablespoons of olive oil in a saute pan until hot. Saute the onion and garlic until softened but not browned. Add the other tablespoon of olive oil and the eggplant, zucchini, and red bell pepper. Season with sea salt and pepper. Stir the mixture occasionally and cook until the vegetables are softened, about 10-12 minutes. Add in the tomato sauce and the oregano and thyme. Simmer the ratatouille for 5 minutes, until the vegetables are cooked through. 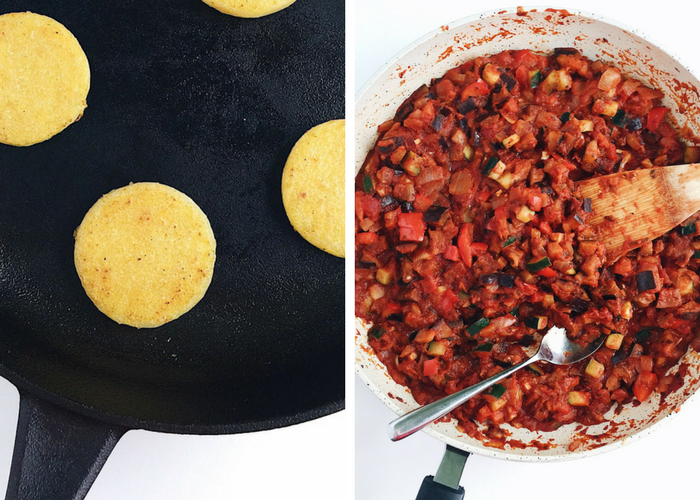 While the ratatouille cooks, slice the polenta into 1/2″ rounds. Heat a non-stick pan until hot and sear the polenta in olive oil until golden brown, about 4-5 minutes per side. Top the polenta rounds with the ratatouille. Garnish with fresh basil. Enjoy! Wow these photos though?! Holy smokes I want to eat my computer screen. Gimme dat polenta!! This looks so inviting! I wish I had seen it sooner to make for a party tonight! The ratatouille looks so tasty! Polenta in this form is one of my favorite types of comfort food. It sounds incredible with your ratatouille – perfect for entertaining. I can’t tell you how much I love polenta. So, needless to say, I’m definitely going to try this recipe. Wow! 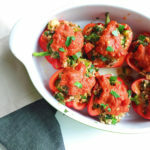 What a great way to eat Ratatouille! I usually eat it on pasta!